Experience uniquely personal navigation from the elegantly slim nüvi 3760T. It features a multi-touch glass display, nüRoute™ technology with trafficTrends™ and myTrends™, lane assist with junction view, subscription-free traffic, and hands-free calling capabilities. The new nüvi is less than 9 mm thick, about the same as a standard #2 pencil. It has a full glass 4.3” diagonal multi-touch display. Dual orientation capabilities allow you to use the nüvi 3760T either horizontally or vertically, fitting smartly in your hand when walking. Sleek design also disappears neatly into your pocket or purse. With a rechargeable lithium-ion battery, it’s ready to guide you by car or foot. Smart and good-looking, this uniquely personal navigator comes with advanced routing capabilities that include trafficTrends™ and myTrends™. There’s no subscription necessary, no added costs, your nüvi 3760T just does it. With trafficTrends, your nüvi 3760T automatically learns daytime trends for traffic flow to improve your routes and better predict your estimated time of arrival based on time of day and day of week. And you get free trafficTrends™ updates every time you connect your device to myGarmin. With myTrends, when you save your regular destinations in your “Favorites,” your nüvi 3760T will, over time, begin to figure out where you’re going even without your telling it! It provides time of arrival and relevant traffic information. So whether you’re driving to and from work or a regularly scheduled weekly event, your nüvi 3760T will help you get there on time. For hands-free calling, nüvi 3760T integrates Bluetooth® wireless technology with a built-in microphone and speaker. Just pair it with your compatible Bluetooth phone and talk hands-free through the 3760T while staying focused on the road. Simply dial numbers with its touchscreen keypad to make a call. To answer calls, just tap the screen and speak into its built-in microphone. Enjoy convenient one-touch dialing for contacts and points of interest. Dual orientation capabilities allow you to use the nüvi 3760T either horizontally or vertically, fitting smarly in your hand when walking. With its enhanced pedestrian navigation capabilities and dual-oriented screen, nüvi 3760T is the perfect travel companion for getting around town. Download optional cityXplorer™ content to help you navigate the big city. In addition to knowing where to walk, where to catch the bus, subway, tram or other transportation you’ll also have access to mass transit schedules and estimated travel time to your destination. cityXplorer maps are available for select cities throughout North America and Europe. And with prices as low as $9.99, you'll have money left over to spend in the big city. nüvi 3760T has an intuitive interface that greets you with two simple questions: "Where To?" and "View Map." Touch the color screen to easily look up addresses and services and get voice-prompted, turn-by-turn directions that speak street names to your destination. It comes preloaded with detailed City Navigator® NT street maps for the U.S, Canada and Mexico with nearly 6 million points of interest (POIs) such as stores, restaurants, hotels, entertainment venues, gas stations, ATMs and more, and speed limits for most major roads. Also offered on nüvi 3760T are standard nüvi features that go beyond navigation. For example, ecoRoute™ — a green feature that helps you calculate a more fuel-efficient route, tracks fuel usage and more. Also included are travel tools such as a JPEG picture viewer, world travel clock with time zones, currency converter, measurement converter, calculator and more. 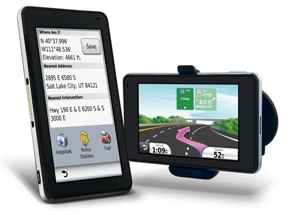 With photo navigation, you can download pictures from Garmin Connect™ Photos and navigate to them. With "Where Am I?" emergency locator, you always know your location. Simply tap the screen to get your exact latitude and longitude coordinates, the nearest address and intersection, and the closest hospitals, police stations and fuel stations. It also has Garmin Lock™, an anti-theft feature, and is compatible with our free Garmin Garage where you can download custom voices and vehicles. Enhance your travel experience with optional plug-in microSD™ cards. * Full coverage mapping for the U.S. and Canada. Now includes Mexico. nüvi 3760, preloaded street maps for the U.S., Canada and Mexico, vehicle suction cup mount with speaker, FM traffic receiver/vehicle power cable, USB cable dashboard disc, and quick start manual. ¹Lifetime traffic extends for the useful life of your Garmin traffic receiver (as long as you own a compatible Garmin GPS) or as long as Garmin receives traffic data from its traffic supplier, whichever is shorter. Traffic content not available for all areas. See www.navteq.com/rdstraffic for traffic coverage areas and www.garmin.com/traffic/fm/navteq.html for program License Agreement containing complete terms and conditions. I decided to buy the 3760 after having the 250W Garmin for several years. I wanted a GPS unit that would warn me of traffic issues and could route me otherwise, and also one that had a sleeker design. The only problem I had with my 250W Garmin was that it took a long time to pick up satellites and then route me to the place that i wanted to go. The 3760 has upgrades like a better design, sleek, can be hand held horizontally or vertically and it does look like an IPhone. You can also use it as a walking navigation system which is neat, although I've always just used this as a car navigation. However, I must stress that one of the other reviewers was correct: It does NOT have any accuracy in letting you know in advance that there is traffic or providing any type of traffic updates. So because I live in NJ, (land known for being a constant parking lot), it never warns me that there is an accident ahead and a lot of traffic and never once has routed me to another way to go to avoid all of the traffic which was one of my main reasons for buying this unit. Now, that being said, I did try to adjust all of the traffic settings on the unit to ensure it was turned on, but it still does not work to update me in advance of the traffic. NOT WORTH $400! I think that it is worth it if the traffic updates would work like it claims to do. I'm debating whether to return it for a new unit or just return it for an older Garmin (like the 765) which everyone claims to work well, and it's cheaper, too because it's an older model. The other features of this unit were fine, it picked up the satellite signal very fast, and it could locate all of the addresses I placed in the unit to travel to, even confusing areas of New York, NJ and Connecticut with no problems. The unit, just like other Garmin 3700 series units, somehow gets extremely hot when you use it even for just a short while. It almost seems like it is burning and that was alarming because obviously high tech devices should not be so hot to the touch. It is also a very delicate unit, if you do not handle electronics carefully in general (and I know I've dropped my cell phone/ipod once or twice by accident), this is not the unit for you. I ended up buying a Garmin 1490T factory refurbished unit from amazon, and so far, I love it! Once I received it, I opened the amazon box. Since the unit is refurbished, it didn't come in a 'new' box, but it was definitely nicely packaged, and well I don't buy items for the packaging anyway. Just to let any readers know, I have never bought a refurbished product electronically, so I was weary about the effectiveness of the 1490T refurbished, but I read a lot of reviews on Amazon before making my decision and when I found I disliked this unit so much. in the unit. I had to provide proof of purchase to Garmin by scanning over my receipt and once Garmin received this via email, I received a 2011 map upgrade for free. It took about 2 hours of time to download from the Garmin website (but this updated map was provided by Garmin for free and was ultimately worth it.) The 1490T has a wide 5 inch screen. Once the new map updates were placed in the unit, the 1490T was great - it showed traffic updates, connected with signal satellites right away and routed me correctly, and it was even able to route me to a baseball stadium in Philadelphia (I didn't have the exact address of the Phillies baseball stadium on hand, but I was traveling to Philadelphia from NYC), and all I had to do was go to the points of interest, sports stadium, and it showed up. I am happy with this purchase because I only paid $178 for this unit, compared to the $400 I paid for the 3760 (minus the $80 I lost since i had to return it). So I recommend going with a refurbished unit like the 1490T if you want something just as good. I would just suggest that once you receive it, to upgrade the maps to the 2011 version and then it should work well. I know it sounds like a pain to do all of the steps above to make the 1490T refurbished unit working well, but it is worth it, in my opinion. The first thing you will notice is the screen; sharp, bright and viewable in almost all conditions. Garmin adopted an iphone design (aka iphone 4) and some of the gui. You can see it landscape or portrait mode depending on how you are holding it. You can also use two fingers to zoom in and out, change perspective and even rotate the map. Though after trying the unit, it was hard going to other gps interfaces. You flip through lists with a finger, and even has some inertia to keep the list moving. The downside is that sometimes it is hard to select, because it tries to move the list. The unit fits into your shirt pocket, but you might want to get a sleeve to keep it from getting scratched. Unlike the iphones, the 3760's screen gets smudged from oily fingers. Something happened to my unit's databases, though I was able to test the maps and navigation. In general it works like most garmin units, but couldn't sort the current route nor saved trips. Not sure whether all my difficulties where related to the problems I was having, but the unit kept taking me close but not to the actual locations. Usually told me that the destination was on the wrong side of the street. Their pos database is one of garmin's biggest advantages, however unlike tomtom which know their poi aren't very extensive, you can't modify the poi or street database from the unit. The closest thing is to report the poi to garmin for removal, or update the phone. This 3760 is supposed to learn about your trips, and use that information to plan a better route. Either I didn't had enough trips, or kept going to different places, so I have no idea if it makes any difference. I was really hoping the 3760 would at least have custom avoids like the 8x5 units. This would be specially useful, for those time the unit keeps directing you through that street that is planned to be built within the next 10 years, or that street they keep working on, or the street happens to be the wrong direction. The gps seems to work well, but in some shadow areas seems to have trouble. At one point I was stopped and the unit kept spinning my location. However, it was accurate and fast.Think that it is rather fast to reacquire a lock, because the unit has a sleep mode. I didn't test it in a challenging place like new york, but maybe other users can share their experiences. Didn't notice it showing my location on the wrong street or side of the access road, like the 765. Once more not sure if it was related to my difficulties, but the unit wouldn't show where the car was parked, nor change modes (it is design to work with cars, on foot and bicycling) when plugged into the car cradle. In general the unit is a nice gps, but garmin left out some feature that would make the user's life easier. It is indeed nice, and did I mentioned the screen? This GPS is head and shoulders better than my previous NUVI GPS. It is slim, sleek and has some really great features. I love the builtin bluetooth, the red-light camera alert is very helpful. Much easier to work with the sound. it is far more responsive and the routes are excellent. Much more improved. However ... periodically it just blanks out ... loses the route and leaves me high and dry. I have to re-start it to get it back. The traffic function is laughable. I'm in the middle of San Francisco and on a regular street and the traffic alert goes off. And, when I'm dead-stopped in traffic it shows no problems. go figure. The security function has yet to work. I am supposed to be able to use it without entering a security code at my home. Hasn't worked yet. If I had to do it over again, I'd buy a different model. I Love GARMIN but I think they rushed this model.